D-1200 series displays are modular flow display centers that convert ONICON insertion and inline flow meters into complete flow monitoring stations. 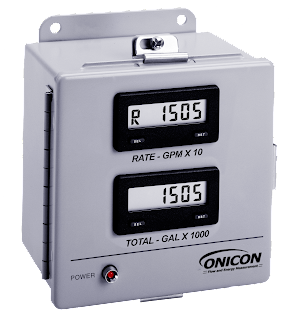 The wall-mounted modules display the current flow rate and total and provide a low voltage DC power source capable of powering most ONICON inline and insertion flow meters. The versatile display module can be located close to the flow meter or up to several hundred feet away. Using the flow meter with the display module will also allow you to support other remote devices such as BTU meters, building control systems, and data acquisition systems.